In July 2013, I had the chance to visit Washington, DC and have lunch at The White House, it was called the Kids’ State Dinner. I wrote about the trip on this blog and shared some photos. After my trip, my Gram asked me questions about the places I went and the people I met. I met the President and the First Lady and Senator Tom Carper. I met a lot of really cool leaders and had a great time meeting kids from around the country. Mrs. Obama asked me what I could do to “pay it forward” since I had a chance to visit The White House and eat lunch with her at the Kids’ State Dinner. I didn’t know how to answer her, but I do know. One thing I remember was seeing homeless people holding up signs that they needed food and shelter. This made me very sad. I remember seeing people around here in Delaware with signs and feeling sad, too. I wanted to help the people. My Mom said it is not a good idea to just give homeless people money and I do not really understand, but it makes sense that it would be helpful to also give food or contact information for places that can help them get back on their feet. One time, before I even started Brae’s Brown Bags, I was in the car with my Mom and we were stopped at a red light. There was a woman standing in the median, she looked tired and sad. I rolled down my window and gave her a water bottle. She thanked me and called me an angel. I realized, I can do something to help out. I am going to continue give to people I see in need. I came up with the idea for the 3Bs, Brae’s Brown Bags. I can put water bottles and food in the bags. My Mom suggested I also put brochures for shelters and organizations that might be able to help the person. So I researched places and put contact information on my notes in the bags I hand out. I gave out a bag this morning (July 11, 2013) to a man standing in the rain. 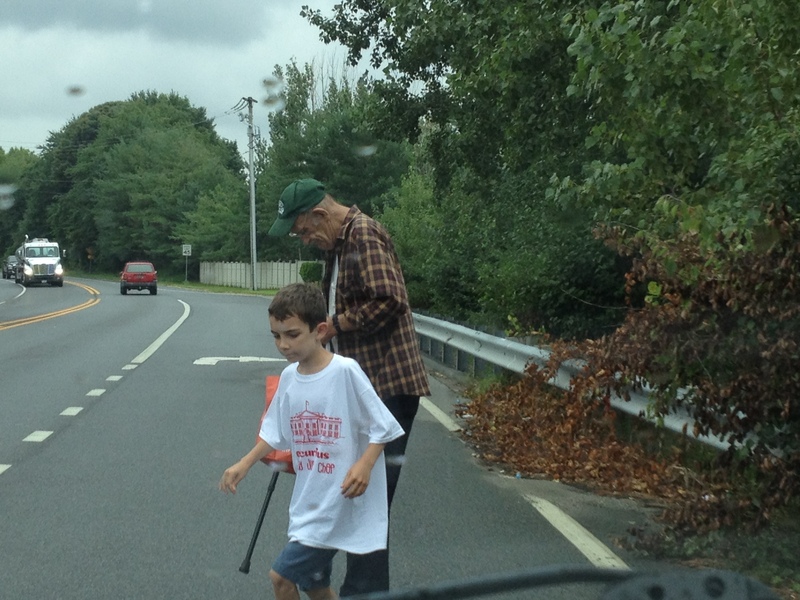 He was holding a sign saying he was homeless and walking with a cane. I felt so sad for him. I put my Mom’s umbrella in the bag, a water bottle, two fruit snacks backs, a bag of chips and a granola bar. When I gave it to the man he said, “Thank you, son.” Before my Mom and I drove away he was already eating the chips. Anytime I see a person on the street with a sign saying they need help I hope I can give them one of my bags and I hope I can help them. Since the very first Brae’s Brown Bag I have decided that I only want to put healthy snack foods in my bags. I have learned that a lot of the time homeless people or people who don’t have a lot of money, usually do not end up having access to healthy food. I think this is important. I think they need nourishment. If you would like to help please let me know. I am hoping to work with organizations that already are out there. Right now I put stuff from home in the bags so if you have extra water bottles or healthy non-perishable food that would be helpful, too. I really want the bags to be healthy because sometimes it’s not as easy to get healthy foods. 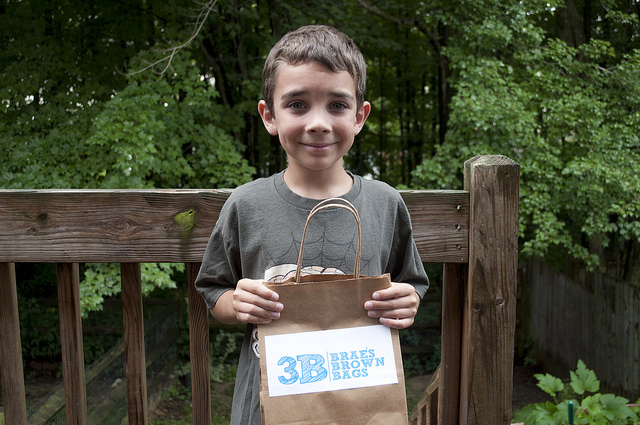 I enjoyed your article very much and would like to help with Braeden’s Brown Bag Project. Thank you I think the more people who help the better. This is a really lovely idea Braeden and I wish you the very best of luck with your project. I’m sure the people you are helping appreciate it more than you know. I’ve been doing something similar the last few years. I travel a lot for work and I’ve always kept a case of water and some snacks (granola bars, packs of almonds, fruit cups, etc.) in my car for myself but since I travel so much, I see so many homeless people all over the place and since I had extra “just in case” food in my bag, I started giving it to them if I could. It’s not much but it feels pretty good to know, even if you didn’t fix the problem, you at least made someone a little bit happier and even after they’ve drank the water, they can keep refilling the water bottle too. You’re an amazing young man doing something amazing and selfless. Keep it up. We need more kids like you and I hope you inspire other people to give as well. I just want to say thanks for what you have started. I just read the Governor’s facebook post about your visit yesterday. I am a Justice of the Peace here in Delaware and we are working to open a Community Court in Wilmington. We have realized that many folks get in trouble with the law because of many of the issues you raise. They are homeless, hungry, need mental health assistance or some other problem. Our Community Court will seek to redirect these folks to the services they need, provide them with a way to repay the community for whatever crime they may have committed and move on to repair their lives. We hope to be up and running in the next year or so. I just returned from San Fransisco where I attended a conference with people from all over the world who are making a difference through their community courts. As part of this process I would love to have you take part in our community court, I think your brown bag project would be awesome as part of the entry into our process. Please email me or your mother can. Thanks again for taking the lead on this, too often people like to point out problems, but then have no interest in working to solve them. You are a true inspiration. Braeden, what a generous young man you are. I made a donation to your cause. I know you will put it to good use. Blessings to you. CW.